EC alumus, Class of 2014, Adam Goeringer came to campus recently to visit with the sophomore and junior boys. Adam was about halfway through his own high school experience when he realized that he was disengaged, and his lack of academic effort wasn’t going to get him where he wanted to go. 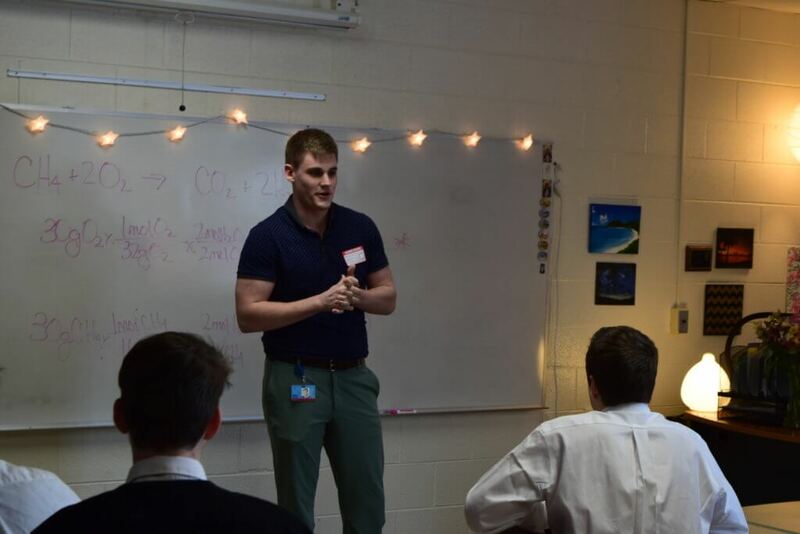 Turning things around during the second half of high school required a lot of intentionality on his part, and he wanted to share this story with current students to encourage them to pursue their dreams with fervor. “The pain of hard work hurts much less than the pain of regret,” he told the boys, encouraging them to put in the work now, rather than waiting until it’s too late. “Ask yourself, am I putting in the same effort in my academics as I give to my athletics? When you don’t get it right on the field, you see it as reason to practice more and try harder. Do you do that in the classroom? Or do you just give up when it gets hard?” He pointed out the value of their education, and the impact that it can have when they engage the learning process instead of cutting corners. After graduating from Everest in 2014, Adam went on to pursue a degree in biology from Grand Valley State University in Grand Rapids, Michigan. He is now following his passion for science as a technical writer for Pfizer, one of the largest pharmaceutical companies in the world.